Over at F1 Fanatic, Keith Collantine has reported that Honda has won the Greenies' Award for their favorite company of the year. This is all thanks to the (ahem) innovative color scheme for Honda's F1 car this year and not, as some have alleged, for the car's environmentally-friendly lack of pace. Keith wonders what the Japanese company will be doing next year to ensure they retain the prestigious award and, thanks to astounding reports coming in over the weekend from my spies, I can reveal the full extent of the revolution about to be released upon Formula One. Agent Double-O 531272 points at an article in The Register as being the clue to Honda's plans. Apparently, Honda is going to market it's hydrogen-powered FCX model in the USA and Japan next year, confounding the experts who expected a long period of beta testing before the car could be on general sale. What the article does not say is that Honda will be using F1 to increase awareness of their bold move, thereby adding to pressure for the spread of hydrogen filling stations in the relevant countries. Although the FIA has ruled that there will be no engine changes in the sport for ten years, Honda knows that only minor modifications to the fuel feed system are required to enable an internal combustion engine to run on hydrogen - and these are not covered by the engine freeze. 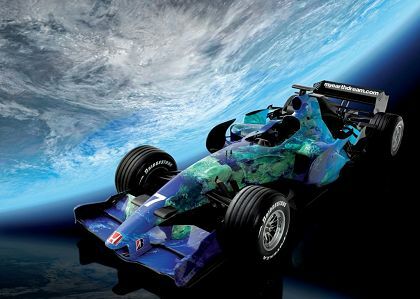 They intend, therefore, to run a hydrogen-powered car in F1 races in 2008. The scheme is devilishly clever. Since the FIA's checks for fuel are all designed for gasoline, they will not be able to give readings on the gas being pumped into the cars. Honda will claim that it is air, knowing that there is no way this can be disproved with existing equipment. They have taken extensive measures to ensure that the hydrogen is only delivered at ambient temperatures, having noted that this is a loophole in the regulations bound to be closed by the FIA before long. One wag amongst my spies is calling the plan "The Watergate Affair", having noticed that the by-product of burning hydrogen is steam. This brings the "-gate" series of scandals full circle and the media will be free to search for other handles to hang on stories from now on. Unconfirmed reports are also claiming that Toro Rosso are preparing a protest against the Honda design that they will lodge at the Australian Grand Prix next year. A journalist for the Nepalese newspaper, Sgilch, has described overhearing a conversation in a Hungarian pizza restaurant, in which it was whispered that STR are in possession of a 7,800-page document that details the Honda plan. This has been denied by STR bosses, Franz Tost adding that he would "punch the lights out" of anyone saying otherwise. Gerhard Berger was also alleged to have mumbled something about it all being on CD now anyway. Readers are advised to take these revelations with a sizable dose of salt; my spies have been known to get carried away and exaggerate on occasion, especially when on assignment in Japan, where the saki is a little strong for them, I suspect. But, just in case it all turns out to be true, remember where you heard it first! Our clocks here in Britain got put back an hour at the weekend to allow for the darker nights and mornings - I think I've inadvertently put mine back to 1st April! Hehehe, I think the same thing has happened to me, Craig - my computer tells me it's 9:43am today but everyone else insists on 10:43! Haha, damn you Clive! Just for a second I was excited at the prospect of a hydrogen-powered F1 car, but even more excited that a loophole like that both existed and was being exploited! You have answered one unasked question though... what does an F1 blogger do in the off-season? So who do you think will win this year and I will NOT put money on him?? Yes, it could be another Hamilton/Alonso situation except that the personalities involved are different. The drivers are a lot more laid back (and the one time they did shove each other off this year it was sorted out without too much drama) and the team manager very capable and level-headed. I think they will be fine regardless of who gets ahead. It's just that I think the older one deserves it after so many years of being ignored. And I'd be pretty happy if the bearded one got the championship as well. Hey, maybe McLaren and Ferrari can get each other thrown out for childish behaviour off-track. Then he could have the championship this year for acting like a grown-up! I think the bearded one is a very serious young man - it's no act!